I've never had what I would really call a healthy body image. I spent most of my childhood and teenage years thinking I was fat, although in retrospect I was being silly. When I see old pictures, it makes me sad because I spent so much time hating my body instead of enjoying what it was capable of. I thought I was fat and clumsy and never wanted to join in any kind of physical activity, at school or at play. I consoled myself with thinking it was okay to be a bookworm, smart was enough. It wasn't until I was pregnant with Roo that I started thinking about my body in terms of health versus attractiveness. Looking good became less important than being fit and healthy. Food became a fuel source more than an activity. I actually wanted to exercise, to make labor and delivery easier and safer for myself and for my future baby. Over the past seven years, with two natural childbirths under my belt, I lost my sense of personal well-being. Moms notoriously put others' needs before their own, but it's no excuse for my laziness. I never really worked to lose the weight after Jasper was born and our lives got busier and somehow, here I am almost four years later with an extra fifty pounds weighing me down both physically and mentally. Obviously, I am in need of some changes, so I was glad to be asked to participate in a 31 Day Challenge to start 2011 off in a healthier way. Lean Cuisine and The Skinny Cow have asked eleven bloggers to document the changes they're making this first month of the new year… allow me to introduce the Lean 11. Our goals vary, from weight loss and strength training to energy gain, but we're all committed to taking steps toward a healthier 2011. I've started doing the 30 Day Shred DVD again and already feel a change in my energy level and muscle strength, although I've actually gained a couple of pounds. I'll be reviewing other fitness games and books this month, letting you know how they work for me, and counting my calorie intaking using Lean Cuisine meals for lunches and The Skinny Cow treats. I picked up a couple of these to stock my freezer and was surprised at how much better Lean Cuisine meals look than I remember. Lots and lots of choices to suit most palates. As a bonus, if you collect twenty codes from boxed Lean Cuisine meals before March 31st (excluding Market Creations), you can redeem them for a cute lunch bag. I am partial to the graffiti style, personally. Okay, on to the accountability. Here I am, post-Shred, at the beginning of January. I know, it's not pretty. One of my big resolutions for 2011 is to stop running away from cameras, like I've been doing since I was 9 or 10, so I am keeping it real with an ultra-rare snapshot of me in workout clothes. Shudder. What are your goals for the new year? Share them with me! Hey lady! For one thing you don't look bad at all in your work out outfit!! I love that you are going to stop running away from cameras... you are much too much of a beautiful person to be camera shy! It is going to be great working with the 11 of you on this project! So psyched to be doing this challenge with you. 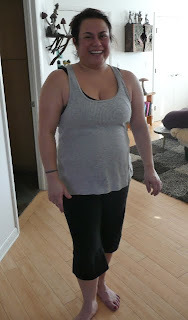 We've both complained again & again about wanting to lose the weight & we're FINALLY doing it! You look great, honestly! Can't wait to see you in a month. I am really wanting to lose weight too (as always), but obviously this pregnancy is in the way of that. Though I've been eating healthier and haven't gained much (yet). Naomi--you're a total inspiration to me. I have been looking for a home workout video, going to check out the Shred DVD. Good luck! This is such a great challenge! Really enjoying doing this along with you. I hear you about growing up. I remember a time when I tried dieting on only rice cakes and water because I thought I needed to lose more weight to run in track. Yet I was thin but back then I didn't see that. Now I wish I had somewhere near that body but I've had four kids and packed on some weight after that last two. It's time to shed this old skin and replace it with some new thinner skin. I'm using the treadmill now every day this week. I've tried all the meals you have a pic of except the ravioli. I must say the fish is my favorite out of those. I am so proud of you! Let me know if you want to get out and walk sometime or something. I'd be more than happy to do it with you if we can get our schedules to align. Love you!